Dancing on a tree top. 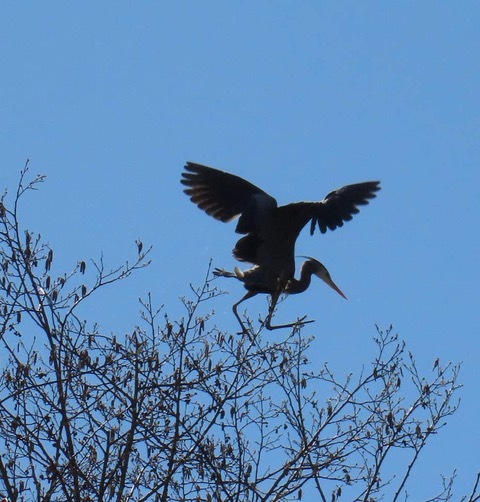 Taken last Saturday, March 30 at the Shorewood heronry. Photo courtesy of Nancy Downing. There will be a Public Hearing—at the request of heron advocates— on a subdivision application of the last undeveloped plat in Shorewood in Edgemoor, adjacent to the heronry at Post Point in Fairhaven. The subdivision, if granted, will create two building lots for development with a green space in between. The hearing will be held on Wednesday, April 10th 2019 at 6:00 p.m. in the City Council Chambers, City Hall, 210 Lottie Street. Please show up to express your concern over how this subdivision and subsequent building will threaten Bellingham’s last remaining heronry. Here’s the background. Nesting. Taken Friday, Mar 30, by Nancy Downing. The Great Blue Heron colony at Post Point has had some exemplary champions within the City of Bellingham over the years. Now-retired operations supervisor at the Post Point water treatment plant, Larry Bateman, comes to mind. Larry went to bat for the herons when the city needed to expand the water treatment plant adjacent to the herons and now there is an expanded protective buffer, fencing, trails and informational signage about the gawky, pre-historic looking birds that we love. Former City Councilmember Louise Bjornson was also an effective advocate for the herons. Against all odds, including noisy trains and an off-leash dog park, the heronry is actually expanding. 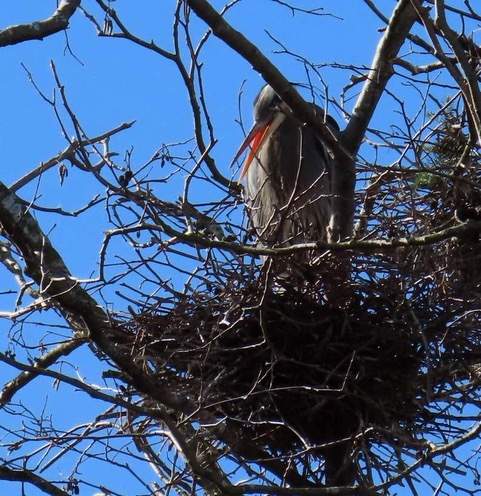 During the 2018 nesting season, there were 41 active nests, and the herons are back and at it again right now. What a wonder! In 1999 the herons arrived at Post Point and had the good sense to nest in protected deciduous trees owned and maintained by COB as part of the initial buffer around the water treatment plant. They had been uprooted from their earlier colony on Chuckanut Drive when nesting trees were cleared to build the Blue Heron Estates. There was also a very regrettable lost opportunity in 2016 when the owner of the Shorewood plat agreed to sell it to the city for $550,000. The Greenways Committee recommended that the city purchase the land, thus guaranteeing protection for the city’s only remaining heronry on its exposed Edgemoor flank. Not sure why, but the Parks Board declined to pass along this recommendation to City Council for consideration. Opportunity knocked and was knocked out. Proponent’s 2018 overlay of herron colony seems to short change the recommended buffer. See attached letter. Now there is a proposal to subdivide the Shorewood plat to build two luxury homes with a sizeable green space and conservation easement between them. 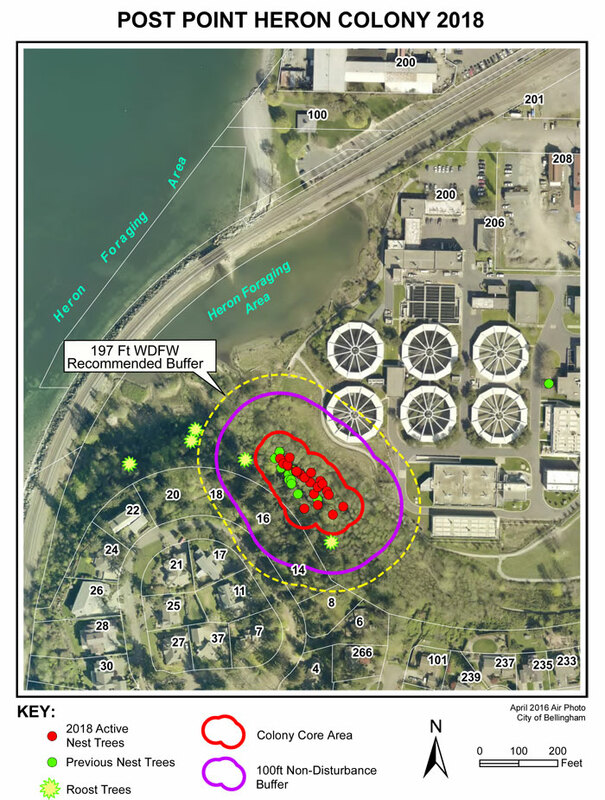 This plat is re-named, ironically, the “Heronwood Cluster.” Perhaps this is better than prior development proposals for this sensitive area, but it has several critical flaws: COB has already approved —with no public process— a Critical Area Permit which will allow the housing lot closest to the herons’ nesting trees to encroach deeply into the city’s own designated 197-foot buffer around the colony. The encroachment will be “offset” by adding a similar amount of buffer to the extreme end of the plat, furthest away from the heronry, where it is not so urgently needed. This sleight of hand “averaging” of the protective buffer might be allowable under current Critical Area permitting codes, but it undermines recommendations from both the wildlife biologist hired by the city to monitor the heronry, as well as management recommendations from the Washington Department of Fish and Wildlife for protecting Great Blue Herons, a Washington priority species. We’re witnessing what could prove to be the tipping point for the heron colony: an encroachment approved by the city, as well as the planned removal of large conifer trees on the Shorewood (oops, I mean Heronwood) building sites that could expose the nests to south winds which the herons cannot tolerate. Why would the city allow ANY new potential risk to the heronry when we have invested citizens’ tax dollars for years of heron management and protection? 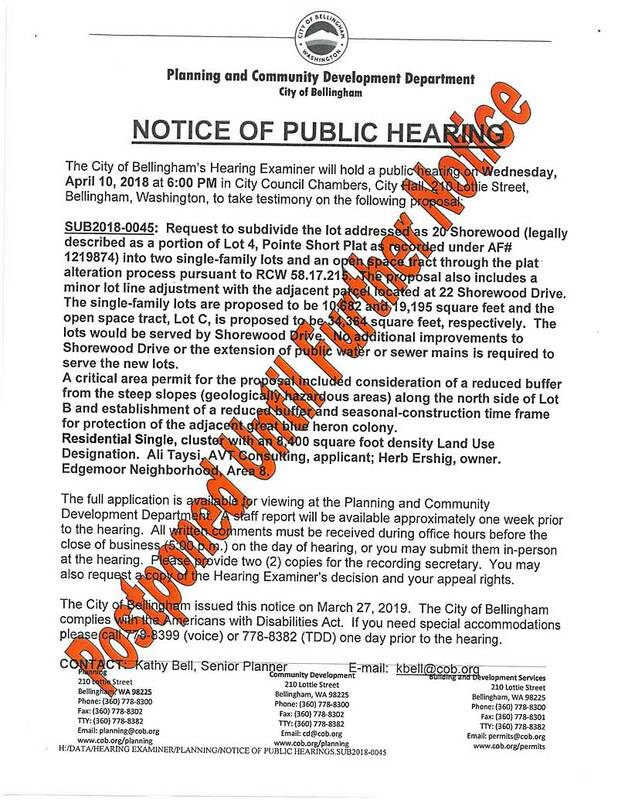 The city’s Planning Department exercised its prerogative to not invite public input into Critical Area permitting process for the Heronwood Cluster and this is where all the environmental concerns including “mitigations” were considered. One can choose which of the dueling wildlife biologists you want to believe about how much tolerance the herons have for these newest human threats: the biologist hired by the Heronwood Cluster’s proponents for its environmental report, or those of the biologist who’s been monitoring the heronry, at the city’s request, since 2003. You decide. After all, wouldn’t it be a travesty if, once again, the Great Blue Herons of Bellingham were flushed out of a safe nesting site because of a luxury development project that bore their name? Proponent letter noting critical area map is erroneous. Of all the ecologically related topics to be concerned with in our area, the Great Blue Heron’s “plight” seems pretty far down the list. The Great Blue Heron lives from Alaska and southern Canada, through virtually all of the contiguous United States (excluding the desert regions) and down into Mexico, Central America and South America. If they could hitch a ride, they would happily invade Europe, Asian and Africa too. If Global Warming precipitates Global Flooding, the Great Blue Heron’s population will undoubtably increase. Now, I know folks in our area like to be known for their politically, socially and ecologically “wokeness” but this, I believe, seems a stretch. How about some intellectual honesty? Why not just admit we are opposed to any growth at all. We don’t want a growing population. We don’t want anything new other than perhaps a few more lawyers, dentists and coffee shops…Oh, and rich retirees who can pay their taxes without complaint. Jamie, thanks for writing about this issue and bringing it to our attention. As you know, and as noted on page 4 of the planning department’s critical areas permit, “The great blue heron is considered by the state as a ‘priority species’ and the heron colony is considered a priority habitat because it supports the priority species… Designation of the heron colony meets the definition of a habitat conservation area (HCA), in accordance with BMC 16.55.470 A(1)(c). State priority species and the habitats with which they are associated require protective measures for their continued existence.” These are the facts and the law. The real question is whether buffer averaging, which allows for reduction of the buffer in certain locations to be offset by increases in other locations, will adequately protect the heron colony. As you stated, that is a matter of opinion. I’d also like to thank Konrad for expanding the conversation to include the question of growth. Konrad would like for us to “just admit we are opposed to any growth at all.” I’m not prepared to do that, but I believe most fiscally conservative members of the community would agree that we should not promote additional growth where the marginal costs exceed the marginal benefits. The Center for the Advancement of the Steady State Economy (CASSE) makes a strong argument that there is an underlying conflict between Economic Growth and (1) Environmental Protection; (2) Economic Sustainability; and (3) National Security & International Stability. Anyone who argues for infinite growth ignores the obvious. Infinite growth within finite constraints is simply not possible. The size of the economy cannot exceed the capacity of the environment. At some point, we will stop growing. The only question is the extent to which we overshoot these constraints and suffer the consequences. Contrary to Konrad’s claim, it is not a matter of just admitting we are opposed to growth. It is a matter of having a conversation about whether additional growth is beneficial or detrimental. To date, the city has refused to have this conversation. Perhaps someone running for mayor will have the courage to deal with this issue before it’s too late. Historically, there has always been tension between mankind’s desire for ever- increasing growth and the desire for allowing areas it to remain untouched (as in our National Forest lands); however, I believe we can all agree that not all land can be kept as National Forest or Refuge land. The concept of dedicating and maintaining those areas to non-development is laudable and necessary. Land within incorporated city limits originally deemed suitable for development, being re-designated as “refuge” land seems questionable at best. Particularly when taken in light of the fact that the Heron (the supposed reason for this concern) is far, far, far from threatened status. Just as all land can not realistically be held in “refuge” status, not every species can be included as a “priority species”. When we begin including every living thing as “priority”, we diminish the importance of concern regarding species that are truly in jeopardy. It is OK to admit we as a society want no further business, industrial or residential development, as long as everyone has a say and the goals are clearly stated so that rational decisions may be made by that society…not by a select group of radicals bent on control of every natural resource or square inch of dirt on planet Earth. Attempting to claim some form of moral status based on someone else’s desire for profit is a cowardly and deceptive argument. Profit is not, I repeat, not an evil concept. Providing goods and services to others for profit has been the greatest destroyer of poverty mankind has ever seen. Taking other’s natural civil right to dissent, the right to use one’s own property within social norms or the confiscation of one’s gain by hard work; however, is unquestionably evil. Let’s just be honest about our goals and how we intend to achieve them. Meanwhile, the Great Blue Heron is doing fine. It is one of the most adaptive and prolific species ever created. As to folks claiming they want “conversation”: The above commentary shows exactly how much “conversation” some folks actually want. As soon as opposition to their agenda is seen, the opposing opinion must be castigated or otherwise impuned in order to nullify that opinion. It is a very good idea to get your family and friends to sign up for this “further notice”. These things have a habit of returning around holidays or proceeding around schedule changes. Please add me to the list for notification of any further action on SUB2018-0045. Eternal vigilance is the price of freedom!